Cards from G-BT14 Divine Dragon Apocrypha and G-CB07 Divas’ Festa. Some card text is blurry and may be incorrect. ACT (VC) 1/Turn [Choose a face down card from your G zone and turn it face up] Soul Blast any number of cards, for each Soul Blast 1 (? ), choose one of your rear-guards, and it gets Power+4000 until the end of the turn. If you Soul Blast 3 or more cards, draw a card or Counter Charge 1. [AUTO]:[Bind this card face up & Choose another card with “Heal” from your drop zone, and bind it face up] When this card is discarded from hand for the cost of calling a G guardian, you may pay the cost. If you do, Counter Charge 1 or Soul Charge 1. AUTO When this unit is placed on (GC), choose up to four cards with different grades from your drop zone, put them into your soul, if you put two or more, this unit gets Shield+5000 until the end of the battle, then, if you put four, this unit gets Shield+10000. CONT (RC) Ritual 3 During the battle this unit boosts, this unit gets Power+3000. AUTO (RC) 1/Turn Generation Break 1 When your other rear-guard with the Ritual ability is retired for the cost or effect of your card, you may put that card into your soul. ACT (RC) Darkness [Retire this unit] If you have 20 or more soul, choose cards with the Darkness ability with different Grades, shuffle them into your deck, if you sent back four, choose up to five of your units, and they get Power+6000 until the end of the turn. ACT (RC) Generation Break 1 Darkness [Put this unit into your soul] If you have a grade 4 vanguard, draw a card, choose one of your rear-guards, and it gets Power+3000 until the end of the turn. ACT (VC) 1/Turn [Soul Blast 1, choose 5 rear guards with “Chouchou” in their card name and put them on the bottom of your deck] Draw three cards, this unit gets Power+20000/Critical+1 until the end of the turn. 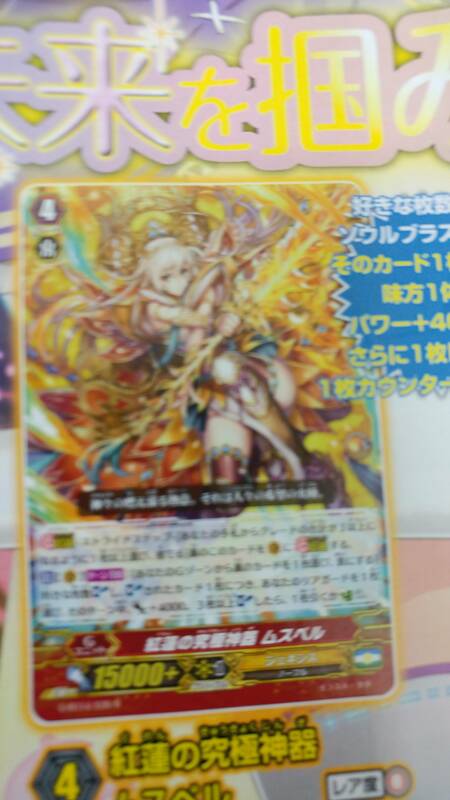 CONT (RC) Generation Break 1 If you have a vanguard with “Chouchou” in its card name, this unit gets Power+2000, all of your Grade 2 or greater rear-guards with “Chouchou” in their card name get “CONT (RC) Resist” and “Boost”. AUTO [Choose a grade 3 from your hand, and discard it] When this unit is placed on (RC) you may pay the cost. If you do, check the top seven cards of your deck for a grade 2 or higher card with “Chouchou” in its card name, add it to your hand and shuffle your deck. CONT [(RC)/Hand] If you have a vanguard with “Chouchou Debut Stage, Tirua” in its card name, you may pay Stride cost by sending this card to your drop zone. Next month’s promo is Joyous Jiro, a Genesis <High Beast> card. The Apostles attack the Vanguard Association’s North American Branch to complete the revival of Gyze. Misaki and Darkface face off. Aichi and Kai face off against Chaos Breaker in a 2 on 1 Card Fight, aiming to stop Chaos Breaker and return Noa to normal. Onimaru Kazumi aims to return Kazuma to his former self, facing off against Gyze with Shiranu’s new power. The world begins to return to void and nothing. TryThree faces off against Gyze in the ultimate final battle of the G Era.